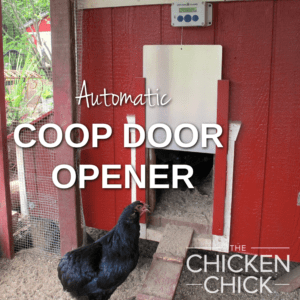 Are you considering an automatic chicken door opener for your coop? If so, you’re going to appreciate legendary poultry author, Gail Damerow’s thoughts about her new ChickenGuard popdoor opener! 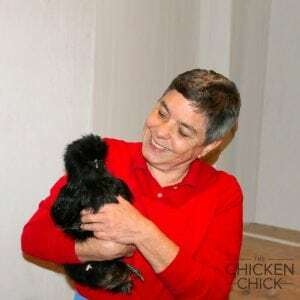 Legendary poultry author, Gail Damerow with one of her Silkies. See all of her books and bio HERE! 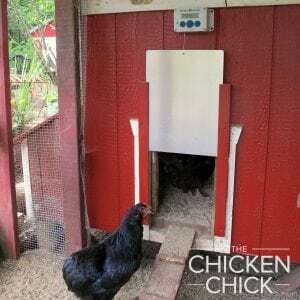 A device that automatically operates the pophole door is ideal if you’re not always available to let your chickens out in the morning or lock them up at dusk. In my case, such a device is indispensable, since two of my coops are some distance from the house and the third coop is even farther way — not real convenient for early morning door opening and late closing in inclement weather. 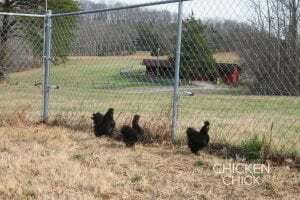 Silkies in one of Gail Damerow’s chicken yards. Over the years, clever chicken keepers have devised all manner of automatic doors. One of the most innovative takes advantage of the fact that chickens drink most often first thing in the morning and again just before going to roost. The drinker was attached via a rope and pulley to the top of a bottom-hinged pop-hole door, which closed and opened as the drinker was, respectively, filled by the chicken keeper and emptied by the chickens. Another ingenious system used the weight of the chickens going to roost in the evening to close the door, which opened again in the morning when the chickens hopped off the roost. Both these inventions required careful calculations and keen observation on the part of the chicken keeper. Happily, there are a large number of ready-made coop door openers that work right out of the box. Like homemade door openers of old, ready-made doors operate by a variety of mechanisms. The grand-daddy of them all is the string-lift door. It slides up and down in a pair of runners operated by a take-up spool mounted above the door. The spool winds up a string to open the door, and slowly feeds out the string to close the door. ChickenGuard is arguably the most sophisticated of the string-lift doors. Its spool, enclosed in a weather resistant plastic box, operates electronically and is programmed via three buttons and a generous LCD display. The control unit is available in three different models. All three have certain features in common. They may be operated manually, for when you want full control over opening and closing the door. They all additionally have a timer that lets you specify when you want the door to automatically open in the morning and close at night. When the door closes, a red indicator light blinks to let you know, from as far away as 100 yards, that your chickens are safely inside. Four AA batteries are included. When the batteries run low, the door-closed indicator light stays on continuously. This feature is especially handy. A Brand X door opener I once had simply quit when the batteries ran down — not good if the flock gets locked in all day or, worse, the door stays open all night! A set of batteries should last at least six months, but a good management plan is to put in fresh ones during the twice-annual time change. Personally, I prefer plug-in door openers. The most difficult part of operating a door opener with internal batteries is changing the batteries, which involves removing screws that hold the control unit cover and wiggling out the battery compartment. Anyway, the high tech ChickenGuard is readily adaptable to plug-in power via a USB port at the bottom of the unit. All you need is an Abosi universal wall charger and a type A male-to-male USB cable. Then it’s goodbye internal batteries! All three ChickenGuard models operate at temperatures from 110ºF down to -10ºF and are covered by a three year warranty. All three come with or without an aluminum door and a pair of sturdy oak runners. The door is a generous 12 inches wide by 16 inches high, enough to accommodate most chickens, guineas, ducks, and the lighter breeds of turkeys and geese. ChickenGuard door runners shown painted red. And now for the differences between the three models. “Standard” is the most basic unit. It has only a timer that lets you program what times you want the door to open and close. Using a timed evening closing means you have to constantly change the timer as daylight hours lengthen or shorten throughout the year. On the other hand, being able to set the timer for a late morning opening is great if you have predators lurking at dawn waiting for the door to open, or you want to keep your birds in until they finish laying. Ducks are especially notorious for hiding their eggs unless they are confined during their morning laying hours. The “Premium” model has both a timer and a daylight sensor that can be set to automatically open the coop door at dawn and close it at dusk. The sensor must receive light during the day — ideally on a west facing wall (toward the setting sun) — and be in the dark at night. A security lamp or back porch light, or even a light shining through the coop window at night, can confuse the sensor into thinking it’s daytime. 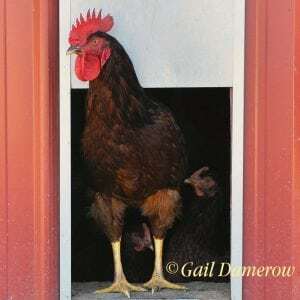 My yards have floodlights I occasionally use to check for young chickens that might have missed closing time. Turning on a floodlight opens the chicken door, so I have to remember to turn off the light after bed check is done. A really nice feature of the ChickenGuard is that the light sensor is integrated into the control unit. Our other three door openers have a cable with the light sensor at the end, which allows flexibility for adjusting the sensor’s position relative to the sun. But if you have dairy goats, like I do, be prepared to replace chewed-up sensor cables. ChickenGuard makes this a non issue, because the light sensor is part of the control unit itself. 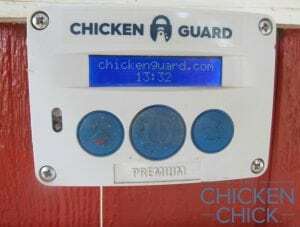 So instead of adjusting opening and closing times by moving the sensor — to get more sun exposure so the door opens a little earlier and closes a little later, or more shade so the door opens a little later and closes a little earlier, the ChickenGuard has both a sensor delay feature and the ability to combine the sensor and timer to complement one another. With the latter option you can, for instance, set the door to open at a specific time in the morning but close at dusk, whatever time dusk might occur. The “Extreme” model is for anyone who keeps chickens in an extreme climate, such as Arctic Alaska or the deserts of Australia. It has all the same features as the “Premium” model, but operates at a greater range of temperatures — from 120ºF to -20ºF. The outer casing and inner components are constructed to military grade standards to withstand weather extremes. Additionally, for weather conditions that require you to use a heavier door than the standard aluminum door, the “Extreme” has a stronger motor able to lift a door weighing up to 8 pounds, while the other two models are designed to lift up to 2 pounds. 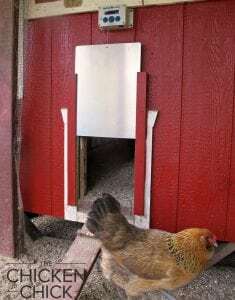 I frequently hear chicken keepers say that a string-lift door is easy for raccoons to open, however, I have used this style of door for more than a decade and, with plenty of hefty raccoons on the prowl here, none has ever lifted a closed door. If you’re concerned, though, you can keep raccoons from lifting the door by placing a channel (similar to the door’s side runners) at the bottom of the pophole for the door to slide into when closed. Or you could mount the door inside the coop, making sure it closes slightly below the pophole opening so a wily raccoon can’t slide its clever little fingers underneath. For mounting the door inside the coop with the control unit on the outside wall, ChickenGuard offers a pair of optional plastic pulleys. These pulleys may be used, as well, for mounting the control unit other than directly above the door, for instance on a wall that offers better daylight exposure for the sensor. The pulleys also may be used to open more than one door with a single control unit. The ChickenGuard is manufactured in the United Kingdom. Doors and runners sold in North America are made in the United States. Responsive customer service, technical support, and any necessary repairs for North America are provided in rural Texas by passionate chicken keeper TJ Parkhill. More information may be found at ChickenGuardian.com. 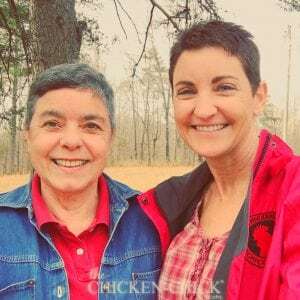 Many thanks to Gail Damerow for sharing her thoughts about the ChickenGuard with us! Love all the useful info you provide. Also am very jealous of your yard, coops, garden, etc!